The Truth Two Hole Cam Handle 1-1/2" Inline has a die cast construction with a powder coated paint finish. It features an 1-1/2" hole spacing. We find the numbers 45086 on the right hand handles, and 45085 on the left hand handles. 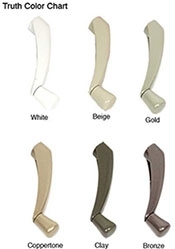 This handle is very popular on aluminum framed commercial windows due to its low cost. The handle shown in the picture is a Right Hand. Expert Knowledge Review by R. M.
A simple handle and so much to know!